When people are interested in a foreign country, they may peruse its cultural products, establish relationships with a community of expatriates, or go on vacation there. Yet it takes a special breed to move abroad, learn the local language, and study there for an extended period. 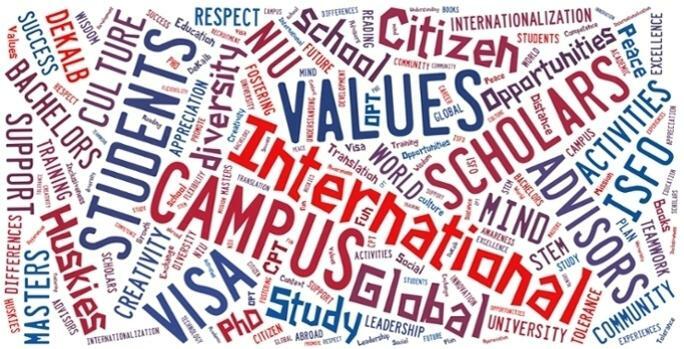 International students have a special place at many colleges and universities. Through them, U.S. institutions develop ties with their counterparts abroad. Their different cultural experiences promote new subjects of scholarship and help broaden domestic students' perspectives. In the case of Northern Illinois University, these individuals make up about 5% of the student body. International Student and Faculty Office Associate Director Stephanie Brown says various countries are represented on campus, but certain nationalities are particularly abundant. "510 of those approximately 1,100 students are from India, 172 from China, and 136 from Saudi Arabia," she says. The majority of this group are pursuing postgraduate degrees, either for academic study, or in the case of Argentinian Fulbright Scholar Marcos Quezada, professional development. “I’m doing a master’s in management information systems, and that’s exactly the mix of information technology and business that I was looking for," he says. While undergraduates certainly have a presence on campus, junior Oleg Grachev says certain factors make them less common. “The cost of education really discourages international students to come here on an undergrad level, and they tend to go to schools that have more favorable financial aid packages, and those tend to be schools with a higher rank, higher tier, more private schools,” he says. The first challenges these students often face is academic. In addition to the language barrier, there often is a difference in how classes are taught. Quezada was familiar with U.S. business culture from working at IBM, but one aspect of college surprised him. “Back home in Argentina, you go to school and that’s it. You take your classes. There’s no participation, no involvement in anything extra. Maybe a few things, but not as many as here. Here you have associations of all sorts and types,” he says. Grachev had a bit more preparation. The State Department’s Future Leaders Exchange allowed him to spend part of high school studying in Paw Paw. Regardless of how much exposure students have to American academics, however, Grachev says standards remain high. “Professors will expect you to be on the same level with any American student as far as your understanding of the material and your contribution to class participation. Since I had this kind of cultural preparation already and had a network here established, it was much easier adjusting to the workload as far as classes go but also being comfortable with in-class discussion and participation,” he says. But academics are only part of studying in a country other than your own. The experience is just as much about making friends and exchanging ideas. Friendships with students of the same nationality are easy but, as Quezada explains, different cultural norms often means befriending an American takes more effort." “I am a Latin American person. We tend to have relationships that are more close right from the beginning. Here in America, you start with, 'Hey, hello.' You have to build up that sort of relationship,” he says. Recognizing this difficulty, Grachev started the Global Friends Network last fall. Operating through the International Student Office, it pairs NIU’s foreign scholars with American counterparts. These individuals then take the role of mentors. Grachev says the goal was to emulate his experience with FLEX. “I felt having something like this, where international students have access to the same privilege, would be a really beneficial thing for our campus along with increasing the globalization of our campus and involving domestic students in international education,” he said. The program has proven to be quite popular, with 40 pairs of mentors and 100 new applications this semester. The feedback has been equally positive. “You could hear international students who say it’s so nice to have a friend far away from home, to domestic students who say that they have never imagined that it’s so difficult to live in a different culture. You just really see both of them appreciating each other much more,” Grachev said. While programs like the Global Friends Network can facilitate relationships, Quezada says a willingness try new things is equally important. “Come here, DeKalb, or any place in the United States with an open mind. Don’t think only about what you’re getting in terms of your professional training or your academic training. Think of this as a 360 degrees experience where you’re going to get more as a person than as a professional. Be open to new experiences,"
For Quezada and his husband, Pablo, that approach has paid dividends. “I have been participating with several groups and organizations within the University. He’s been singing in the DeKalb Chorus, he’s been acting with the Stagecoach Theater. We got invitations for Thanksgiving dinners we go. Everything. We want to live the whole experience of United States culture,” he says. Each student’s approach will differ, but Grachev says no matter where one comes from, perseverance and a positive attitude is key. “If you are a hardworking student, if you are smart, if you are really driven, it will be no problem to find a place and a community that supports you,” he says. Quezada will graduate with a master's degree this May, while Grachev has secured a summer internship with AIG.